That’s the goofy trailer tagline for the American release of Takao Okawara’s Godzilla 2000, the film that many people used to wipe the dirty taste of Roland Emmerich’s 1998 Godzilla entry out of their mouths. 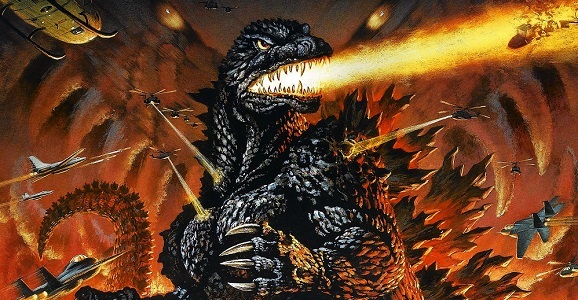 The U.S. stayed away from producing its own Godzilla movie until Gareth Edwards’ recent reboot, but for the briefest of Hollywood minutes, there existed a potential sequel to Godzilla 2000 called Godzilla Reborn. This would have been produced by screenwriter Michael Schlesinger and RoboCop‘s Jon Davison, with Gremlins director Joe Dante behind the camera. Are you kidding me? Sci-fi is full of “What Might Have Been” projects, but the thought of Joe Dante’s King of the Monsters is enough to bring me to my knees. Though the story starts with him, it doesn’t end there, as revealed by Schlesinger in a fascinating recent interview with SciFiJapan. He was the brain behind the idea, which started as a goof, but became a workable idea in his mind. He went to Columbia pictures with a $20 million idea for a man-in-a-rubber-suit Godzilla movie that used the special effects team from Toho, the franchise’s birthplace. Columbia just needed to see a script first. And it had a lava monster. As Schlesinger explains it, “an eruption awakes a sleeping monster called Miba, a giant bat-like creature made of molten lava.” Here’s something to consider: Schlesinger was a producer on cult filmmaker Larry Blamire‘s excellent throwback genre flicks like Trail of the Screaming Forehead and The Lost Skeleton Returns Again. So he’s got a classic movie vibe that doesn’t quite fit in with today’s blockbuster approach. Imagine what could have been. Does it surprise anyone that Marvel’s entry into tentpole films was the bell tolling for this film’s death? When Schlesinger came back with the script, Columbia had Sid Ganis as a new head of production, and he refused to even read Godzilla Reborn, saying he was “in the Spider-Man business,” and that movies with $20 million budgets didn’t interest him. So there you go. Make something that costs a lot of money and uses a lot of CGI but doesn’t incorporate good characters or an actual story and you’ve made a Hollywood studio head happy. No surprises there. 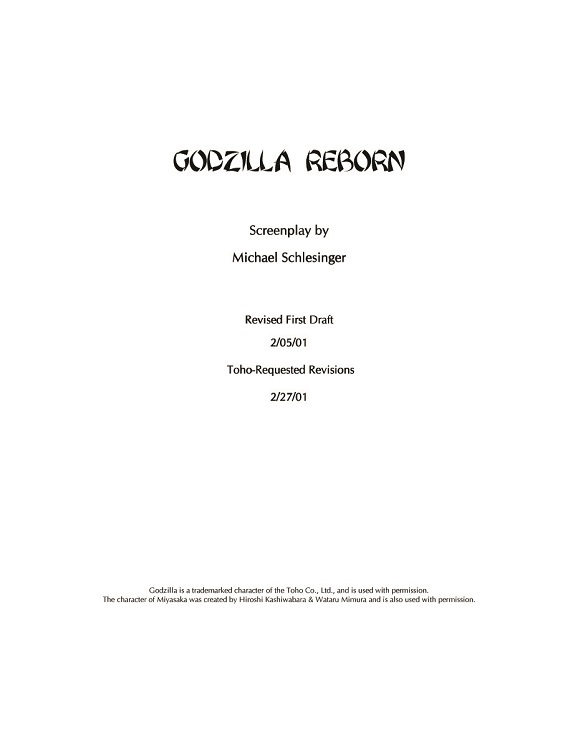 Fun fact: the “Toho-Requested Revisions” on the cover page involved Schlesinger having Godzilla die and come back as a clone to take care of Miba, and Toho got him to change it so that Godzilla was only in a coma. A COMA! Put in the revelation that Godzilla has a twin and a lovechild and this could be the greatest soap opera ever. But even with the coma, having Joe Dante behind a Toho film would have ushered in the 2000s summer movie landscape in a much better way than Sam Raimi’s Spider-Man did. Seriously, check out the full interview HERE. It’ll make you forget all about Ford Brody, just in case you haven’t already.